It’s common to think of the stiffness of a floor as being simply a function of the joists, but the joists work in concert with the subfloor. The subfloor helps to distribute point loads between multiple joists, and it stabilizes the joists so they don’t roll under load. And whereas joists provide strength and stiffness along their length, the subfloor provides these qualities between the joists. There are three main types of acceptable wood subflooring material: plywood, OSB, and solid boards. Until plywood became common in the 1940s and ’50s, subfloors were made from solid wood boards. In the 1980s, OSB subflooring began to gain ground. Today, subflooring is made almost exclusively from plywood and OSB panels. These panels are more cost-effective to install and offer structural advantages, particularly in seismic and high-wind zones. However, old-fashioned solid board subflooring retains wood-flooring fasteners better. Solid board sub-flooring should be kiln-dried and made of so-called “Group 1” softwoods, such as northern Douglas fir, western larch, and southern pine. The boards should be at least 3/4 in. thick and no wider than 6 in. (nominal). Wider boards move more during moisture changes. The boards should be installed at an angle to the joists (45° is most common). This is because it’s best to install the finish floor perpendicular to the joists so you aren’t relying solely on the subfloor to support the flooring between the joists. If both the board subfloor and the flooring boards were installed perpendicular to the joists, excessive movement might occur with moisture changes. 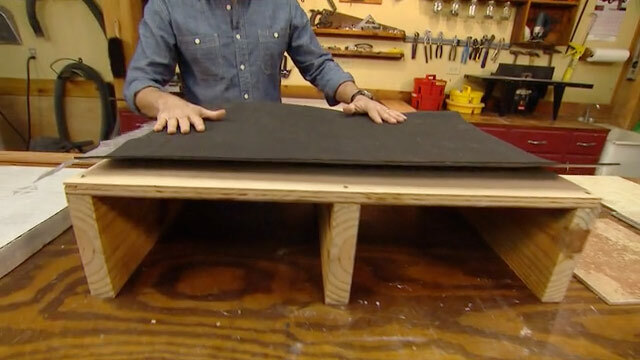 Also, it would be inevitable that the edges of some flooring boards would end up directly above the joints in the subflooring, and they’d essentially be unsupported. Even when board subflooring is in good shape, parquet flooring, thin strip flooring (less than l/i in. thick), and some engineered wood flooring can’t be installed directly over it. A layer of plywood underlayment at least 3/s in. thick is required first. It’s typical for there to be some irregularity between individual subfloor boards, which in most cases can be easily bridged by 3/4-in.-thick wood flooring. However, the thinner strip and engineered flooring tend to telegraph these irregularities. And because parquet flooring consists of small pieces of wood assembled together, any movement of the subfloor boards that would be accommodated by most strip or plank floors will cause gaps and squeaks in parquet. Since the plywood underlayment is more stable than board subfloors, it solves this problem.